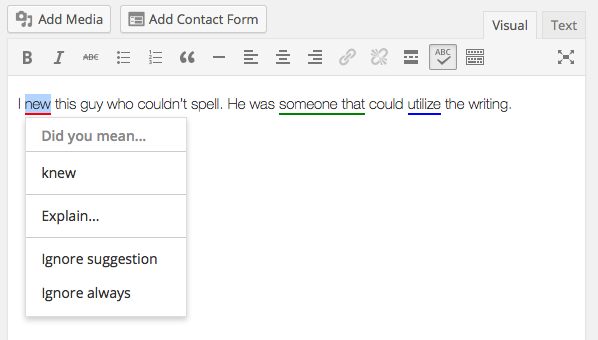 Jetpack can check your spelling, grammar, and style using After the Deadline Proofreading technology. This module can be enabled by switching on “Check your spelling, style, and grammar” at Jetpack > Settings > Writing in your site’s Dashboard. Click in the Visual Editor or in the Text Editor toolbar to check your writing. While proofreading from the Text Editor, you will not be able to type in the editor. Click Edit Text to stop proofreading and return to the Text Editor. The suggestion menu will include an Edit Selection… item at the bottom. Click this to edit the error without leaving the proofreader. You can configure the proofreading feature by going to Users → Your Profile from the left hand menu in your dashboard. After the Deadline can proofread posts written in English, French, German, Portuguese, and Spanish. This feature is activated by default. It can be deactivated any time by toggling the Check your spelling, style, and grammar setting in the Composing section from Jetpack — Settings — Writing in your dashboard. Post content is sent to our servers for the actual proofreading process. This feature uses the language setting of the post author to determine the endpoint to which it should send the content.